Secretary-General Ban Ki-moon briefs the press on Syria. With the United Nations chemical weapons team working “around the clock” to expedite analyses of samples taken in Syria, Secretary-General Ban Ki-moon today called on Security Council members to unite and develop an appropriate response should allegations regarding the use of such weapons prove true. He appealed that any decision that is made is done so within the framework of the UN Charter. The use of force is lawful only when in exercise of self-defense in accordance with Article 51 of the United Nations Charter and/or when the Security Council approves such action, said Mr. Ban. He appealed for renewed efforts by regional and international actors to convene the Geneva conference - with participation from senior United States, Russian and UN officials – “as soon as possible”. Mr. Ban said he will discuss developments in Syria with world leaders attending the G20 summit. Meanwhile, all biomedical and environmental samples collected by the UN chemical weapons inspection team in Syria due to arrive at designated laboratories by tomorrow. 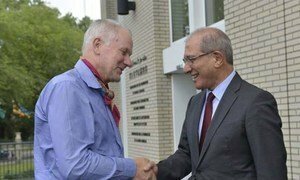 The Secretary-General said that the Mission, led by Swedish scientist Dr. Åke Sellström, has worked “around the clock” since returning from Syria over the weekend to prepare the materials it gathered for analysis. He called for the team to be given every opportunity to complete its task, noting that the UN investigation is “uniquely placed to independently establish the facts in an objective and impartial manner” and to conduct its work strictly according to internationally recognized standards. Once analyses of the samples are completed, a report will be given to Mr. Ban who will share the results with the 193-member Member States and the 15-member Security Council. Mr. Ban has been in close contact with the five permanent members - China, France, Russia, the United Kingdom and the United States. He briefed the 10 non-permanent members of the Security Council earlier today. Also today, High Representative for Disarmament Affairs Angela Kane will brief Member States that had written to Mr. Ban requesting the investigation of the alleged use of chemical weapons in Ghouta area of Damascus on 21 August. “The mandate of this team is to determine the use of chemical weapons – whether there was or not the use of chemical weapons. It’s not to determine who has used against whom. We do not have that kind of mandate at this time,” Mr. Ban said. “This is the United Nations’ decision and my decision,” the UN chief said in response to a question from a journalist as to how the mandate was established. During the press conference, Mr. Ban reiterated that the use of chemical weapons by anyone under any circumstances would be a serious violation of international law and an outrageous war crime. “Any perpetrators must be brought to justice. There should be no impunity,” he stressed. Samples collected by the United Nations chemical weapons inspection team in Syria are now being transferred from The Hague to laboratories for analysis, according to a spokesperson for Secretary-General Ban Ki-moon.